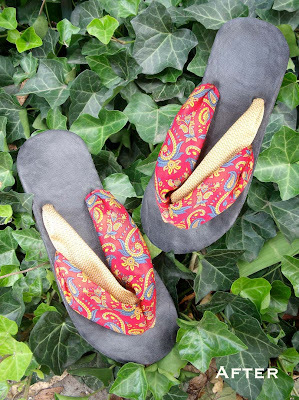 Oh, flip flops, here we are again. While brainstorming what to do with the green flip flops (seen in the previous post) I came up with two ideas. I was still debating which one to go forward with when I found this second unused pair in a thrift store for 99 cents! Clearly I was meant to make both. This post isn't entirely different from last week's in the techniques used, but the change in materials create drastically different, and less casual results. Step 1: Cut away the straps. Step 2: Make a mark with the sharpie 2" away from one of the back two holes, going toward the toe. The hole you want is the one that would be on the outside of your foot, not the one closest to your arch. 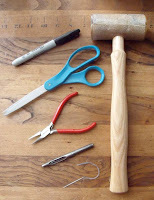 Using a punch and mallet make a hole directly over each sharpie mark. 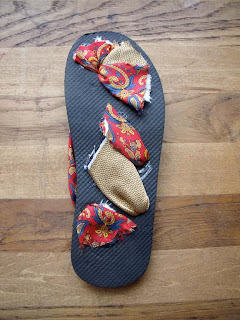 Step 3: Lay each flip flop on the rubber soling. Trace around then carefully cut out the shape directly on the line. 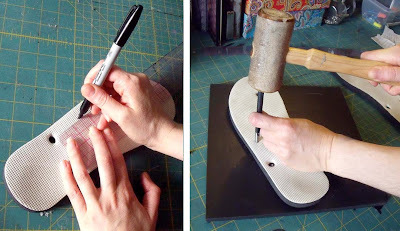 Step 4: Trace the shape of the flip flop onto your leather, as you did with the soling rubber. Since this piece will eventually be going on the top you will also need make a mark within each of the holes. Step 5: Carefully cut out the shape directly on the line and use the punch to make a hole directly over each mark from the three holes. 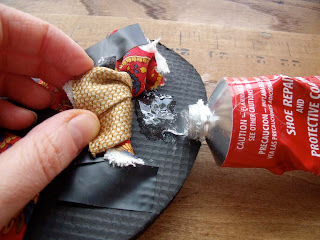 Step 6: Completely cover the the side of the sole that will make contact with your foot in thin layer of your glue. 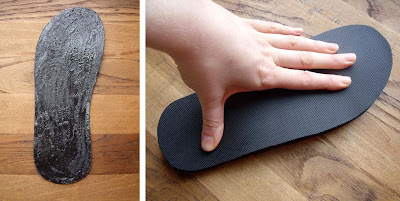 Take your time to carefully lay your material over top of the flip flop so that the holes are in alignment. 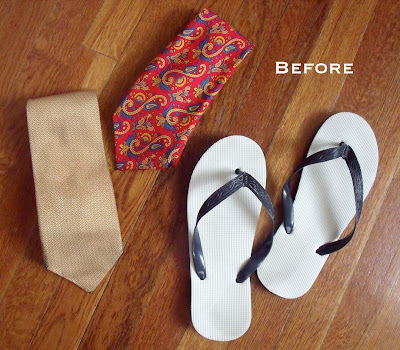 Step 1 : Begin with the tie that you'd like to appear most dominantly. Measure 20" from the tip of the skinny end and cut. Cut that length in half. Follow, by measuring 17" from the tip of the wide end and cut. Then, cut that length in half. Ultimately you'll have four pieces that look like this. 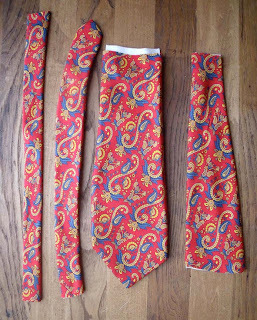 Step 3: Take your second tie and cut around 20" from the tip of the skinny end. 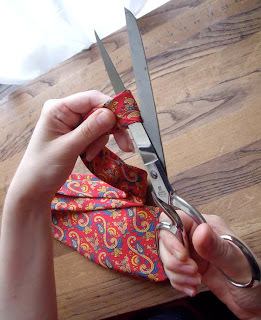 Fold that length in half and cut. Step 4: Sandwich all of the pieces needed for one of the shoes together. The two skinny pieces on top of one another, both facing up, topped with the wider piece facing down. Binder clip them together a several inches from the end. Step 5: Sew together at an angle. 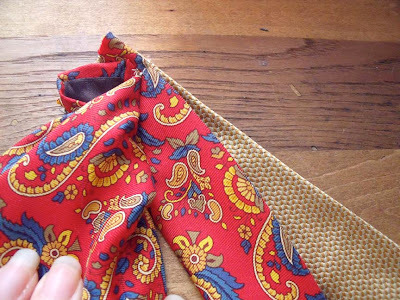 To make it a little stronger you can sew two rows of stitches. If you've sewn them correctly it will look like this when you open it up. 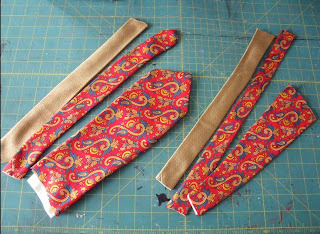 Step 1: Begin inserting the ends of the straps through each of the holes. It was easiest for me to do this was by inserting the straps into the holes with needle nose pliers and then again using the pliers to grab the material from the backside and pull until a least a couple of inches were sticking out. Because the there is so much material going through hole at the toes, you may need to do a little twisting and pulling to get it in to the position you want. 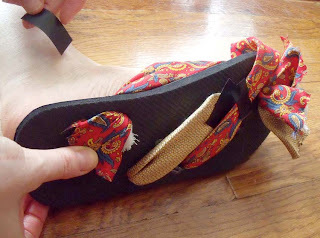 Step 2: Begin taping the pieces of strap onto the bottom of the flip flop. Having your foot in the shoe when you do this step is crucial to ensuring a great fit. Tighten or loosen the straps accordingly, before taping into position. 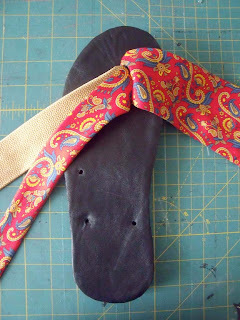 Step 3: If you have any strap pieces too close, or going beyond the edge of the sole trim away with scissors. 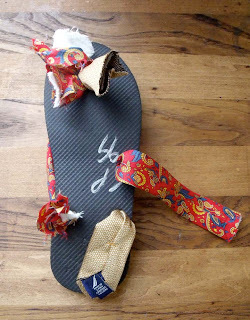 When you are finished with this step the bottom of your flip flops will look like this. Step 4: Begin gluing the straps into place by carefully lifting each strap and putting glue onto the sole and firmly pressing the strap back down over it. 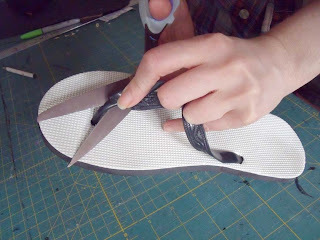 Step 5: Completely cover the the side of the sole that will make contact with the flip flop in a thin layer of glue. 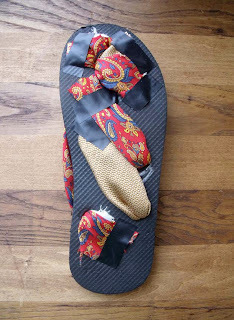 Take your time to carefully lay the soling leather over top of the flip flop bottom. 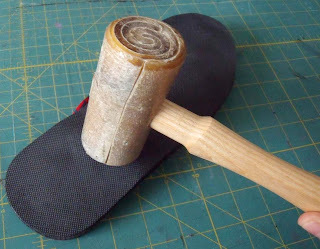 Step 6: Pound with a mallet to reinforce the adhesion, giving extra attention to the edges.